Hey folks, in last Friday's post, I briefly mentioned my Necromunda gang, so thought I'd put up some pics of them today. Whilst looking around at the various options available, I messed around with a few odds and ends I had left over from previous projects and figured that would be the way to go. So, I ended up kitbashing a gang together and am really happy with the way they turned out. They're basically Catachan Guardsmen with heads from the WFB Chaos Marauder Horsemen kit, plus a few extra pieces thrown in. I wanted the gang to actually appear as though they are interracting with the environment. 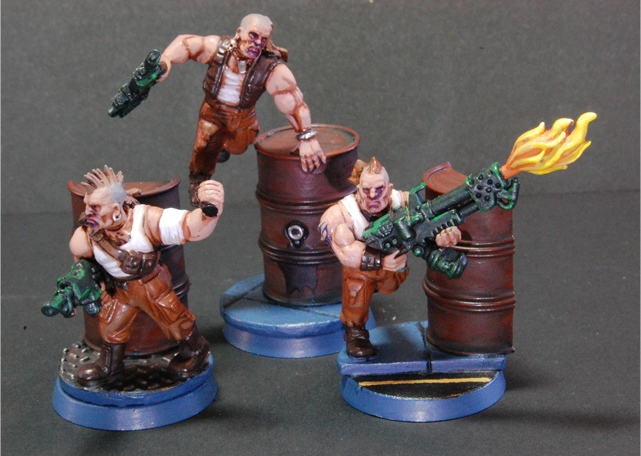 It's not always possible to tell a story on a 25mm base, but these worked out reasonably well, I think. Each of the bases has a textured top, giving further suggestion as to the surroundings. These came from various sources, including the 40k weapon crates kit and a couple of spare Rhino hatches. The paving slab effect on the two in the picture above, was achieved by cutting discs from the WFB modular movement trays. The machine type parts on the bases were looted from the 'Guard heavy weapons team, a Necron Destroyer and the Marine tank upgrade frame. The Genestealer skull came from (I think...) the Scout kit. 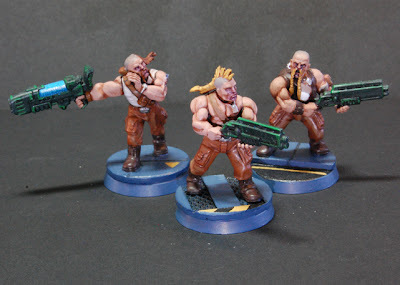 The guy on the left if my variation on a conversion I've seen a few times on the web, with the plasma-gunner shielding their face in case the weapon overheats. I thought it fitted in quite well with the scavenged and crudely maintained feel of the underhive wargear. The shotguns came from the Space Marine Scout kit and required the most modifcation of all of the scavenged parts in the gang. Of all ten figures in the gang, these are probably my favourites, negotiating the barrels. The flamer upgrade worked pretty well too and have since used this on several other figures I've put together. The flame itself is a modified burning torch from the WFB Flagellant warband that was trimmed and filed to fit inside the muzzle of the flamer, which was drilled out with a pin vice. Hope you like the finished articles as much as I do. 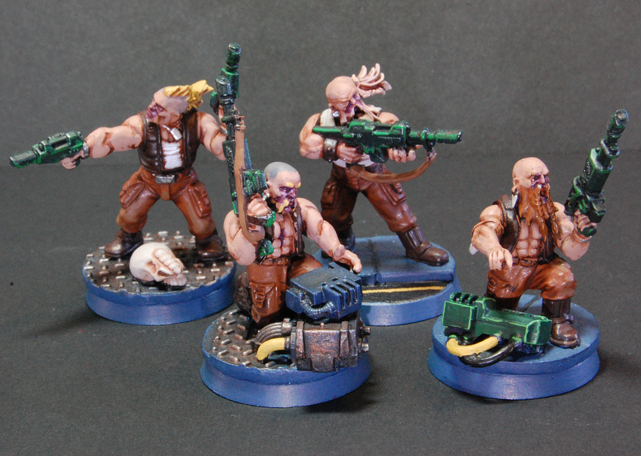 I'm intending to get some pics uploaded soon of the gang I recently painted up for my bro. where are the heads from?